Hey everyone!! We’re on Spring Break and I’m in Dallas with the girls visiting my parents. Do you remember Spring Break as a kid or a teenager? I think I just remember lounging around the house, sleeping in late and hanging out with friends. Since my parents live in Texas, we try to visit as much as possible so the girls can see their grandparents. Anyway, should be a really fun week!! Let’s get to these tacos! 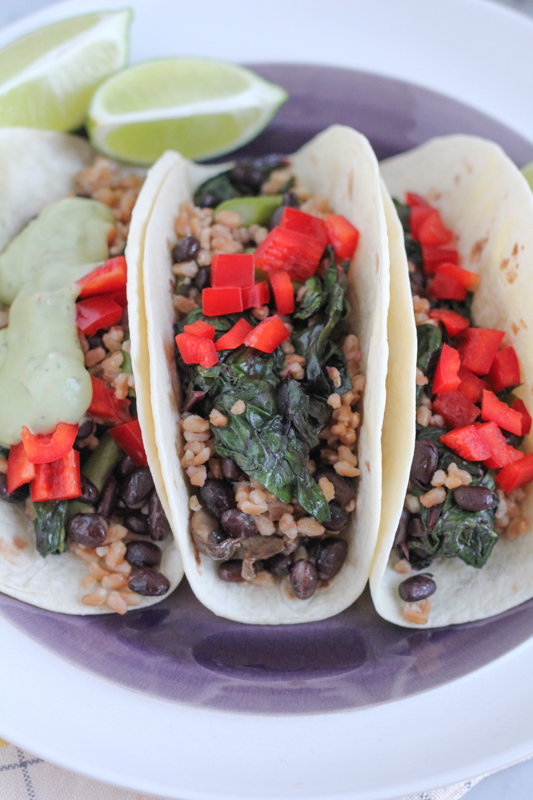 You guys . . these tacos are filled with some of my favorite things: swiss chard, asparagus (which I can’t get enough of these days), black beans, farro and more! And to make these tacos even better, I made an avocado crema . . with a secret ingredient!!! I love the avocado crema on these tacos!! Adds such a fresh and creamy taste!!! I LOVED these tacos! 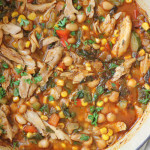 This is seriously the easiest meal to throw together and so delicious! 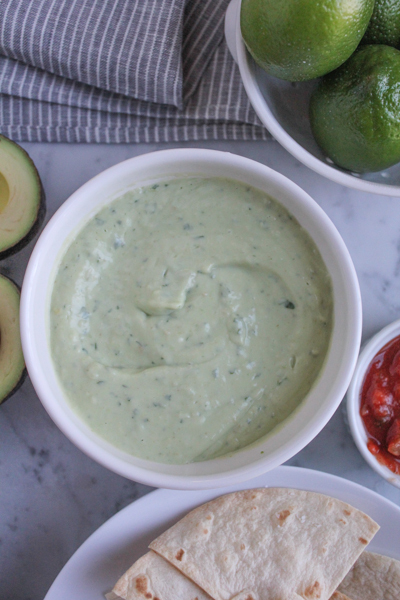 You can even make the avocado crema ahead of time and store it in your fridge. And if you have leftover filling, just eat the filling by itself for lunch! I wish I doubled the recipe so I could eat more of the farro filling! 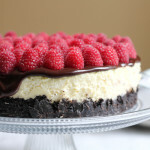 So, click on over to The Kitchenthusiast, where I am sharing my post and this complete recipe! I hope you enjoy! For the rest of the instructions and for the full recipe card, please visit The Kitchenthusiast. 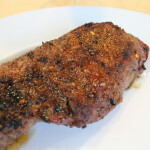 Click here for the full recipe card and instructions. And in case you missed it, enter my giveaway for a KitchenAid NESPRESSO MAKER here!!!! Good luck and I hope you enter! Disclosure: This is a sponsored post in partnership with KitchenAid. All opinions expressed here are 100% my own. « Nespresso by KitchenAid Giveaway!! 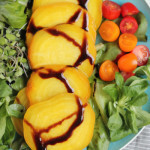 This looks very yummy! I love the meatiness of the farro coupled with the deliciousness of your fresh vegetables! And the crema is superb! You had me at tacos! I can’t ever get enough. Can’t wait to see what the surprise component to the crema is…you’ve intrigued me! These look amazing! I am huge fan of veggie tacos, but so many restaurants can disappoint. I wish you were working at every single one! Definitely giving these a try. I hope you’re enjoying Texas! I miss spring break. I could go for a week off right about now : ) These tacos look delicious! Off to get the recipe! 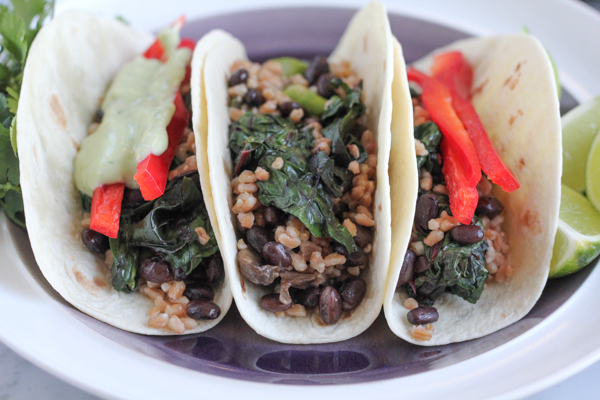 Woah…look at all of the vegetable deliciousness in these tacos! 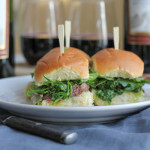 I love a good taco night, but I often look for new twists just to mix it up a bit. This farro is just the twist I needed! I hope Dallas is treating you well…we’ll be there to visit my Dad in a couple of weeks. Our paths almost crossed…haha!! These tacos look amazing, Alice! Love all those veggies and farro and that avocado crema is simply perfect! Hope you have a wonderful time in Dallas with your family! So, these are adorable and so healthy. 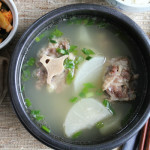 I love this option when I’m not feeling like making some chicken or cooking up some ground turkey. Usually, during spring break, we’d go to Florida to visit my grandparents. This year, my best friend is visiting me in New England from Tampa. I can’t wait. We’re going to NYC and Boston! I’m sure you are going to have a super fun week!! I remember how much I loved spring break and how quickly it was over. Booo! But these tacos look fantastic. I might need to do a vegetarian week soon and incorporate these. Have fun on spring break in Texas! Veggie tacos are the best. I can’t wait to add these to my taco night menu! Love farro and so glad you used it in tacos! These look so fresh and delicious! And the avocado creme sounds perfect! So glad you are in Dallas, because snow is back around here! These tacos sound fantastic, Alice! I love that you used farro in here. So creative! This is just what I need on this snowy Monday! OK this is tacos I want to marry!! They look amazing. Have a fun spring break!! Hope you have a wonderful spring break with your girls in Dallas, Alice – that’s where I am heading to this summer! Btw – that avocado crema sounds incredible – and love the sound of these healthy vegetarian tacos! My menu for Taco Tuesday is set! And adding asparagus to tacos make my dinner even better. Yummm! Have fun in Dallas. Mmm! These look so tasty Alice! That avocado cream looks phenomenal! 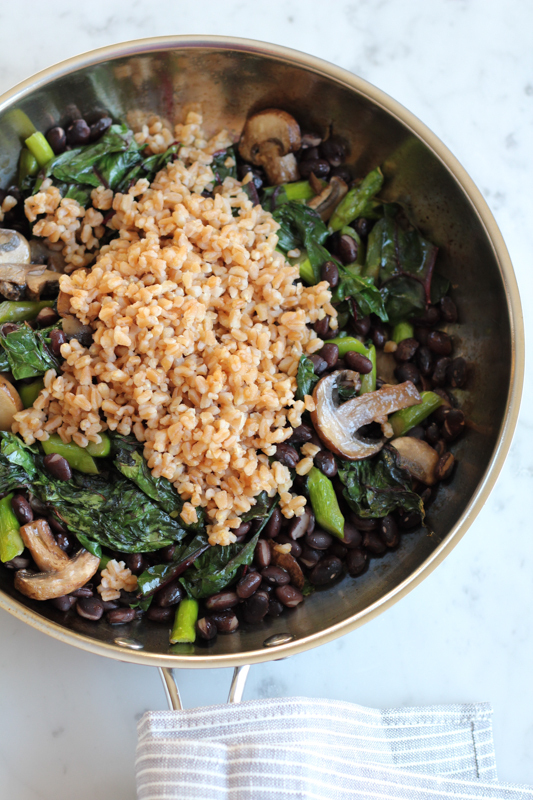 Farro is my favorite grain, Alice, and I made something like this filling last week with mushrooms, swiss chard and asparagus and LOVED it! 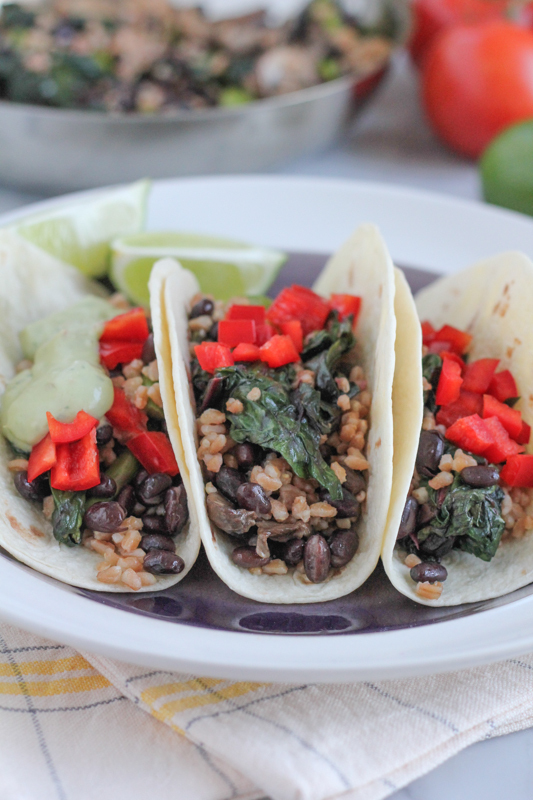 Making tacos with farro is such a great idea, and I really need to do that. Have a wonderful trip! 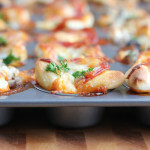 Ooooh yum these look great! I love me some farro and I love tacos 🙂 Jealous of your break, mine’s in like, two weeks! 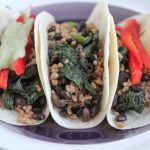 I don’t cook with farro all that often, but I’m always looking for new vegetarian taco options. Love all the flavors you packed in these! 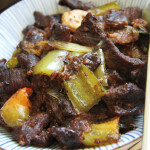 Wow, you know how to make a vegetarian dish ultra-comforting!! I’m all about vegetarian tacos! 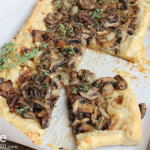 This filling is the perfect mix of nutritious and filling, love the mushrooms and greens! I’ve fallen in love with farro over the past couple months and asparagus, black beans and avocados are some of my favs too! These tacos would be a hit at my house, Alice! In Ohio we had a really short spring break but we got out of school before Memorial Day so I’m happy to give up a little spring for a lot more summer 🙂 These tacos look amazing! Love the addition of farro!